I had a story published yesterday on Eurasianet about an institution that has always fascinated me: the Turkish Orthodox Church. Consisting of not much more than a single family, shunned by the rest of the Orthodox hierarchy, its priests unable to train in any seminary, it seems not so much a church as a shell of one. 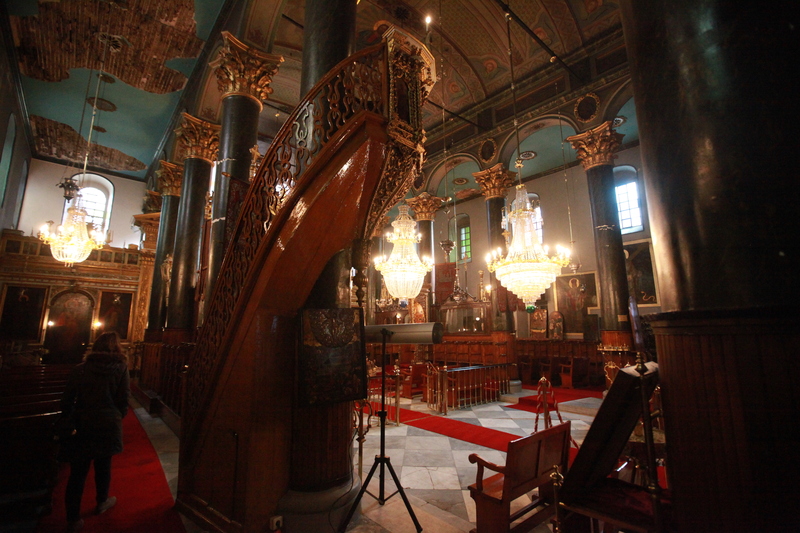 Recently I attended its weekly service at its main church in Karaköy: a surreal experience. The three officiating ‘priests’ – including the Patriarch, Papa Eftim IV – outnumbered the two worshippers, one of whom was Eftim’s elderly mother. In the almost empty building, the swinging of incense and the incantations had a Monty Python-esque quality. However its tiny congregation is the least of the many unusual things about the Turkish Orthodox Church. It has attracted a degree of interest far beyond its size, including – oddly – that of the US State Department, as seen from this cable published by Wikileaks, which gives a useful summary of its bizarre history and cozy relationship with the Turkish state. That was written before, however, the most sensational allegations regarding the church came to light: its alleged involvement in ultra-nationalist plotting and the implication of one of its key members in the ‘Ergenekon’ gang. In late 2007 photos were leaked showing prominent ultra-nationalists, including Veli Küçük, meeting at the Turkish Orthodox Patriarchate. Küçük, a retired brigadier general, is an alleged founder of JITEM, the secret intelligence wing of the gendarmerie that oversaw the extrajudicial killings of scores of Kurdish activists and PKK sympathizers in the 1990s. Sevgi Erenerol, the church’s spokeswoman, was an outspoken member of a campaign that built up steam between 2004 to 2007 to intimidate and generate anger against – ironically – Turkey’s Christian communities. Here you can see Erenerol railing against missionaries at a conference hosted by the armed forces in 2006. She also threw coins at Hrant Dink’s lawyers when he was on trial for ‘insulting Turkishness’. Allegedly, members of this same group were also linked in various ways to some of the prominent murders of non-Muslims in those years, including Dink’s. Küçük in particular has been named as a figure involved in the killing of three missionaries in Malatya in 2007. Both Erenerol and Küçük are currently imprisoned as part of the Ergenekon trial. The obvious question is: Why would a Christian church be a hub of anti-Christian activity? The answer highlights some interesting tensions underlying modern Turkish identity. This was the spirit that filled the heart of Pavli Karahisarithis, an Orthodox priest from Kayseri, when he created the church in 1922 by rejecting the authority of the Ecumenical Patriarchate of Constantinople, the primus inter pares of the world’s Orthodox leaders, and more particularly, head of the world’s Greek Orthodox Christians. Karahisarithis came from within a community of Turkish-speaking Greek Orthodox, who numbered as many of 400,000 and took their name – ‘Karamanlides’ – from their centre at Karaman. They were known for writing Turkish in the Greek script. In the cosmopolitan, ethnically, and religiously mixed environment of Ottoman Anatolia, they were among many communities that blurred the rigid lines of the modern national identities emerging at the start of the 20th Century. During the bloody struggle of the 1919-1922 Greco-Turkish War and the sifting of populations that followed it, Karahisarithis and his followers felt more Turkish than Greek. Turkey, however, didn’t want them. They were not Muslim, and to accept them as Turks would complicate the emerging national identity being forged by Atatürk and his followers. The Karamanlides, therefore, were forced to leave Anatolia along with the rest of its Greek Orthodox community in the exchange of populations between Turkey and Greece in 1924. For his service to the nation, Karahisarithis was allowed to remain – his church a useful foil to the Ecumenical Patriarch. His family changed its name to the more Turkish-sounding Erenerol. Whether, in fact, they really were Turkish is another question. Today, they claim to be the descendants of Turkic tribes who adopted Christianity from paganism many centuries ago. Others, however, argue that they were Greeks who merely adopted Turkish culture and language through long interaction. The question is of little real significance, however it is interesting to note that many of the most ardent Turkish nationalists have themselves come from questionably Turkish stock; the Turkish Orthodox Church illustrates the shaky foundations on which many of the most stridently-held nationalist positions sometimes stand. It’s also important to note that the Erenerols frame their rhetoric against other Christian groups on nationalistic grounds. Christian missionaries and churches are not threats because of their religious activities, but because they serve foreign powers and have an agenda to break up the country, the argument goes. This illustrates a key point about anti-Christian activities in Turkey, particularly the spate of killings between 2005 and 2007. Outsiders have sometimes reflexively attributed these deaths to Islamist sentiments, but nationalism may be the real trigger. Incidentally, while researching all this I was directed towards a highly illuminating report by the European Stability Initiative about the Malatya killings and the subjsequent trial. I began to skim it as I was going to bed the other night and ended up gripped, unable to put it down until I had finished it in the early hours. It offers an incredibly useful insight into the murky nexus between ultra-nationalism, the state, and the mafia in Turkey.